According to figures collated by the Electrical Safety Council approximately 70 people die and 350,000 are seriously injured from electrical accidents in UK homes each year. Nearly half of these problems are caused by house fires which start from electrical fires. These are started by faulty appliances, or fittings overheating and causing a fire to start in the home. Nearly 90% of these fires are caused by electrical products, and although this is mainly due to their misuse, it can also be caused by them being incorrectly wired, having the wrong fuse fitted or being misused. Amazingly, according to the Electrical Safety Council website 2.5 million British adults say they have had an electric shock in their home. It is to be hoped that those who had an electric shock went on to get the appliance fixed before it could go on to start a fire. You can read more about their findings on the Electrical Safety Council’s own website. It’s a no-brainer really, but electricity and water do not mix, so keep your hairdryer out of the bathroom, and your toaster away from the kitchen sink. The water can cause a short circuit in the appliance which can lead to overheating, or sparks that could ignite flammable materials in the home. Long cables which are wound into a coil can heat up and create a great deal of heat, this can lead to damage to the flex and in turn can eventually cause a fire. Electrical cables are designed to keep the live, earthand neutral wires separate from each other, if you damage these casings the wires can touch and cause sparks or heat to generate, and you know what happens next. Some appliances come with a transformer e.g. laptop cables, and may not be therefore transferable from one appliance to another. Wiring in a house should be checked every 10-15 years to make sure that you do not have any safety issues with is. Many electricity suppliers are offering this service to their customers. You can also consider updating your fusebox to MCB’s. We have a project which covers fuses and MCBs if you want more information. Use our Find a Tradesman section if you need a qualified electrician in your area. 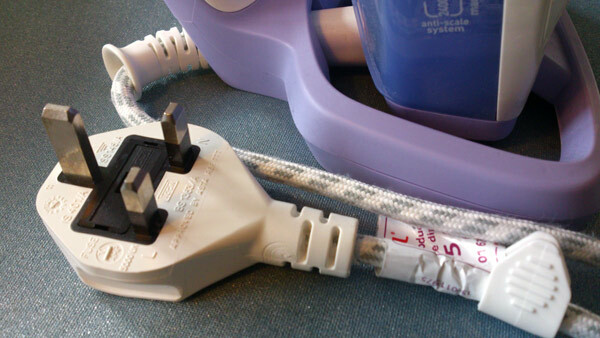 Most appliances come with a moulded plug already fitted to the appliance, and with an appropriate fuse in it. If you need to replace a fuse on an appliance you should get the appliance tested to see why the fuse blew, and you should only replace the fuse with one of a similar value to that supplied by the manufacturer. The fuse is designed to ‘blow’ and stop the appliance form working if it is faulty, this is the most important way of preventing electrical fires. Ok do many people are not good at reading instructions, but it pays to make sure you are using the item properly. Many products have online manuals so they are easy to access – no excuses! 7. Do not cover heaters with clothes, towels etc. With the weather turning wet and miserable you still have to air clothes. Make sure you use an airer and don’t hang anything on an electrical heater or storage heater. If you find your appliance is working intermittently, gives you a shock, regularly blows a fuse or has a damaged cable get it seen to by a qualified electrical tester. See our Projects Section for more advice on electrical safety. You should also get smoke alarms fitted, so that if you do have a fire you are warned about it in plenty of time to get out of the house and call the Fire Brigade. Make sure you keep the batteries in good working order too. See the #DIY Doctor Blog on How to change a battery in a mains powered smoke alarm.